The word Ormolu is coming from the French language "or moulu" meaning "ground gold" as Ormolu was originally made with a coating of ground gold. Ormolu mounting are generally made with cast bronze or brass, which is plated with a gold and mercury coating then soaked in dilute sulphuric acid, giving a gold-like appearance. The use of this word has been extended to copper alloy made with copper, tin and zinc. French call Ormolu, “bronze doré” when the English say “gilt bronze”! It was used mainly to imitate gold and was very fashionable from 17th century to decorate furniture, clock, candlestick, lamp, and also ceramic, It has been particularly developed in France but also in England and more generally Europe. 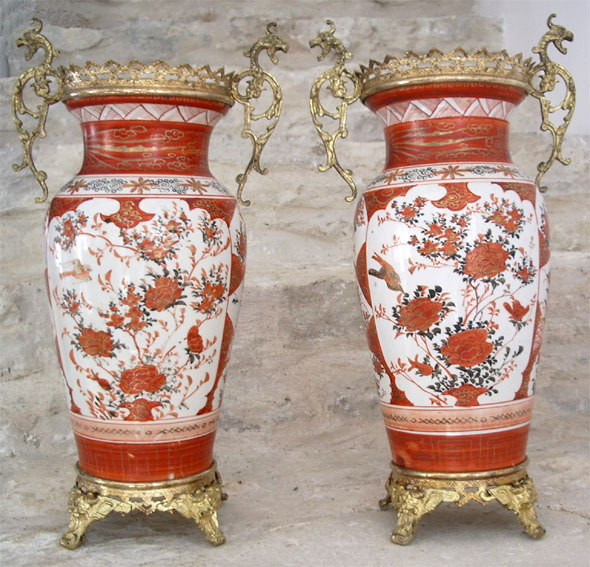 This taste was highly promoted by the French dealers called “Marchands-merciers” whose intention was to combine the colors and the motifs of the oriental ceramics with decorative pieces in popular rococo style. With the revival of the French 18th century art, the ormolu mounted works enjoyed from 1860 an important success and became very expensive. This coincides with the Meiji period and the expansion of the Kutani export. The "Marchands-merciers" imported the wares from Japan and also from Holland and had them mounted with Ormolu fittings in Europe. Ormolu mounts were purchased either directly from the “fondeur” or from the “marchands-merciers”. In order to manufacture the ormolu mounts, two craftsmen were required: a “fondeur-ciseleur” (who cast and chased the mounts) and a “ciseleur-doreur “(who gilded the mounts). Beyond these craftsmen there were always the marchand-merciers, who had the monopoly of dealing furniture. 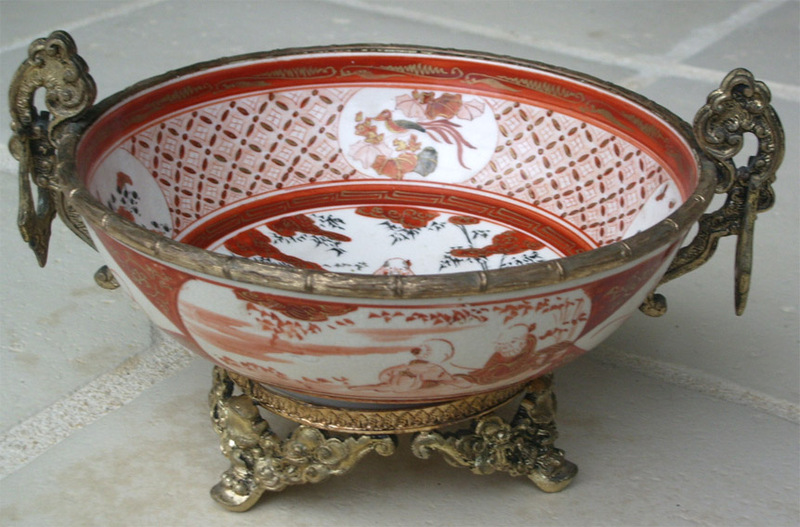 In fact it seems that only in Paris did such system develop whereby a marchand-mercier would put out very costly ornaments on oriental ceramics. Beside Chinese ceramics mounted with Ormolu in 18th & 19th century, we find therefore mainly Kutani dishes fitted with Ormolu mounting. The main reason is that in the period 1860-1900 I believe that 80 % of the wares exported to Europe/US from Japan were coming from Kutani. It was also the period of ’’Japonisme’’ in France. 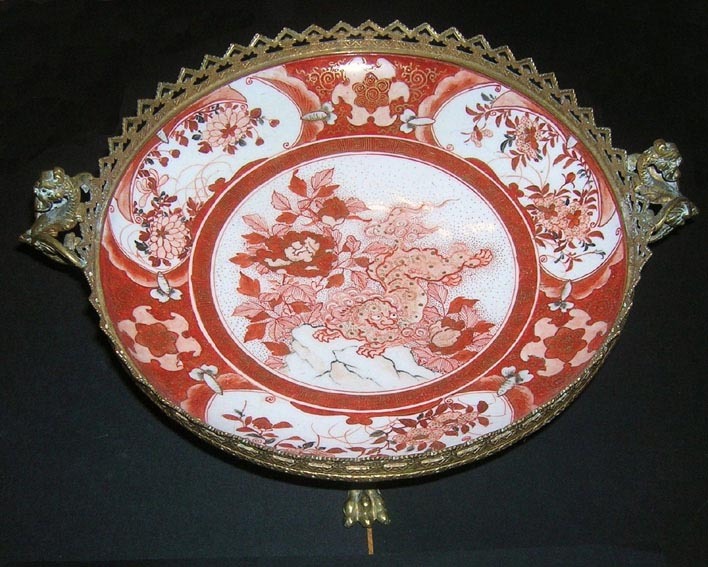 This combination of red Kutani and ormolu is then mainly a French subject as I believe mostly French market was involved. 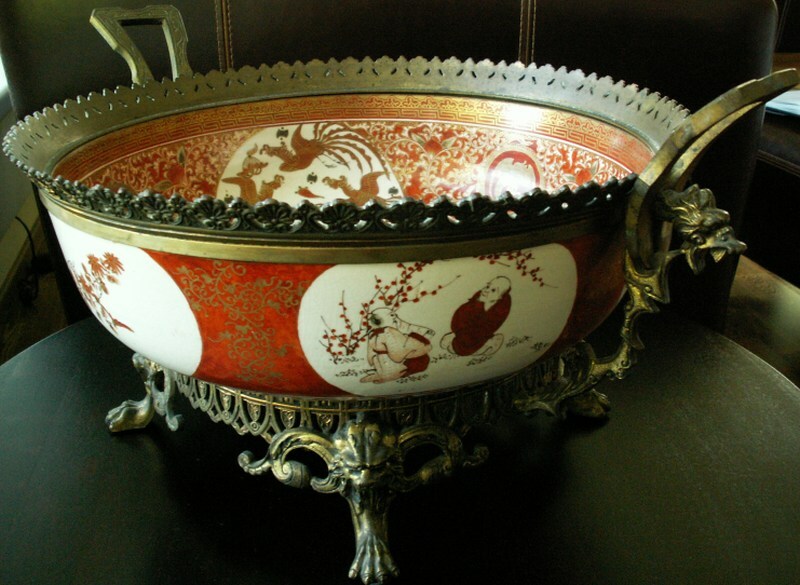 Most of the objects were pair of decorative vases, or dishes with elaborate fittings. Despite the highest esteem in which the ormolu work has been held, almost all the most famous “fondeurs” identities have been lost. On the other hand most of the fittings design seems to be quite generic. The oriental porcelain was highly valuated; however as original ormolu craft was of the highest technique, the real expense was in the cost of the ormolu mounts. 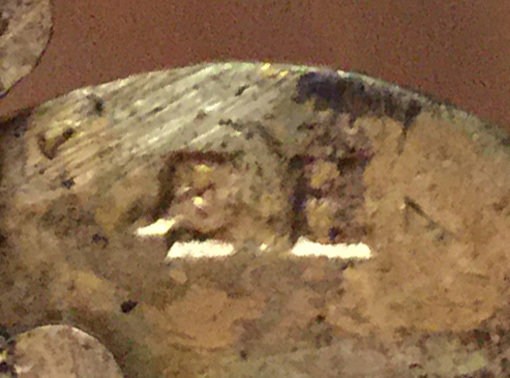 Then forgeries started to appear in copper alloy with tin and zinc. From around 1830 the use of mercury was forbidden in France although it continued to be commonly employed until early 20th century. 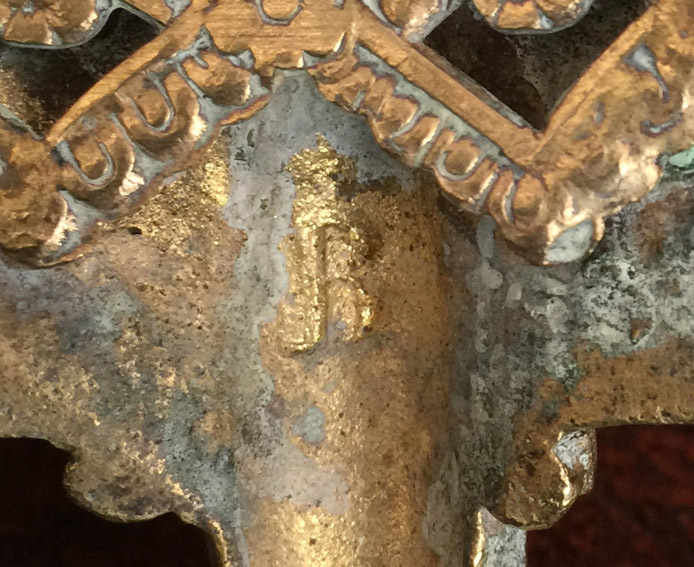 Regarding identities of the cast companies, when looking carefully on each piece, I noticed that some ormolu fittings had a mark stamped or embossed on the feet which might identify the maker. I have been looking around in different archive of the French digital library but cannot succeed to locate where these were mounted and by whom or which dealers were involved in these fittings and which manufacturers supplied the Ormolu, it is still a mystery. What is the process of making ormolu? Firstly we need a model, usually a drawing. A sculptor will then make a clay or wood model. Then the piece is given to the chaser (fondeur-ciseleur) who melts then chisels. The most delicate parts are directly assigned to the carver–gilder (ciseleur-doreur). These two communities, chaser and carver–gilder, frequently argue about their respective rights, some chasers are also sometimes taking care of the gilding. There are two operating modes for gilding: ormolu and gold leaf. We are interested here mainly on Ormolu. Gold is reduced or "ground" on a grinding stone to make gold lime which is then amalgamated with mercury or quicksilver. This mixture is heated in the crucible and applied to the bronze with a brush. The bronze is then deposited on a grid and the evaporation of mercury allows the attachment of gold to the bronze. These mercury vapors are very toxic. Then come hammering, burnishing and setting color of gold, operations which give all its nuances to the gilding. The transitions between matte and shiny parts are merged seamlessly. Reference : Bequeathed by Agnes and Norman Lupton 1953.